Finally I have found a fashionable camera bag that can also double as my handbag when I need it! No more ugly black padded bags that have not style and hang around your neck. Epiphanie bags has an amazing variety of bags, colors and styles to suit every gal, there is a fashionable camera bag for you to be found at Epiphanie! Here’s the bag that I selected from Epiphanie it’s the Sydney bag and I’m using it cross body style! I selected the Sydney bag for a few different reasons. I wanted a bag that could be a cross body or a backpack style bag, especially for when I was carrying more of my camera gear which can be heavy. I like the backpack styles for the heavier loads so that is a must option for me, I wanted a bag in grey or silver and I didn’t want bag that was a mini suitcase, in other words nothing too huge. The Sydney bag met all of my criteria so it was a fairly easy choice. 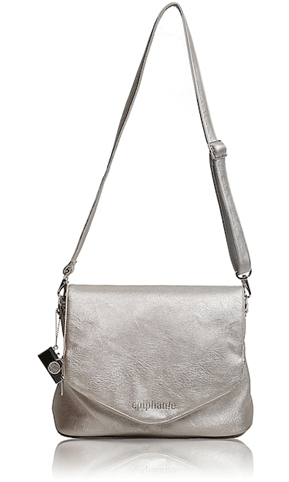 I say fairly easy as I also had my eye on the silver metallic Charlotte bag which is oh so fashionable and a bit smaller than the Sydney but it doesn’t convert to a backpack. The other bag I had my eye on was the Madison, it could be a cross body or a backpack but it was bigger than I wanted. I would still consider the Madison in the future for those times I want a bigger bag and am still tempted by the cuteness of the Charlotte. The Madison is three bags in one! 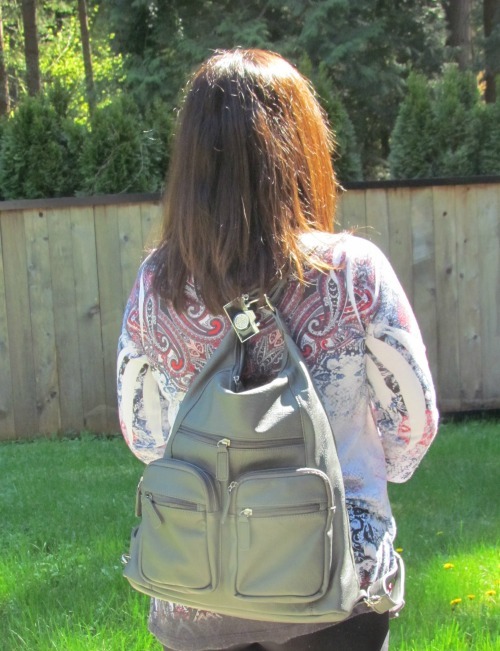 So it can be worn over your shoulder, cross-body, or easily transform into a backpack without removing any straps. I like that I don’t have to remove the straps when I change the style. I admit it took me a bit to figure out how to change it from backpack to cross body without removing the straps, I’d like to see a quick video on how to do it on the Epiphanie site. Some of us need the visual and are a bit slower to figure things out lol. I definitely don’t need a bigger bag right now as the Sydney holds an amazing amount check it out! On this day I had my 15 inch laptop, water bottle, wallet and some goodies in the main compartment and there was still room. 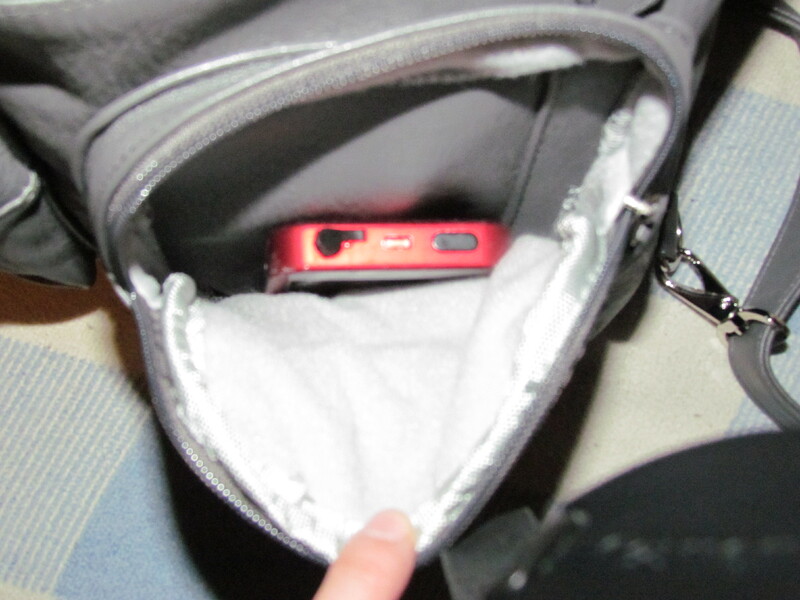 In the front compartments were my phone, cosmetics and more and in the zipper in the bag of the bag were my keys! All with plenty of room to add more! 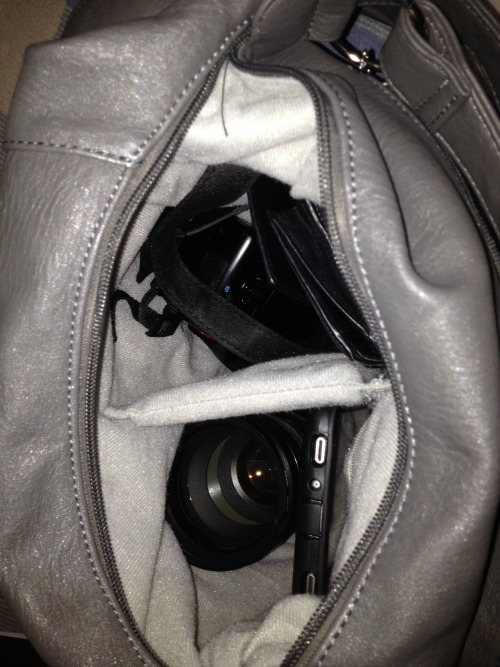 This picture has our huge Canon EOS D30 with long lens, wallet and a tablet in the main compartment. Again still plenty of room left in the main compartment. 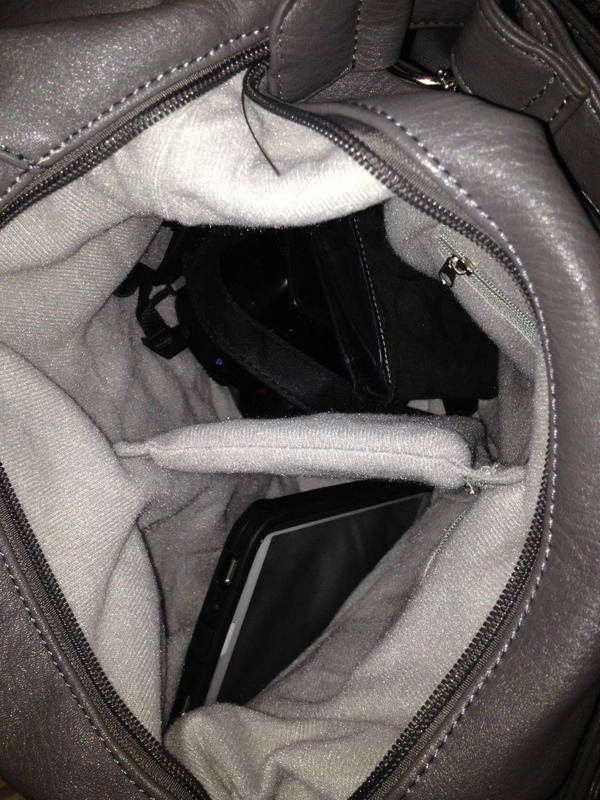 This picture has my smaller Cancon camera and my tablet in the main compartment, my wallet is in there somewhere too. Everything else had the other stuff mentioned above, phone, keys etc.. There’s so much room in this bag love it! Accommodates camera body + attached lens, 1 long lens (including 70-200mm), 1-2 smaller lenses, wallet, cell phone, lip gloss, memory cards and keys. Back pocket designed to hold your iPad! All dividers can be fully removed, so you can easily transition to an every day bag! If you’ve been wanting and/or looking for a fashionable camera bag look no further Epiphanie bags has what you need! They get top grade for fashion forward sense, practicality and ingenuity! Thanks Epiphanie bags! These camera bags are very fashionable, I’ve been wanting to get one of these for a while now. Thank you for sharing this great review. 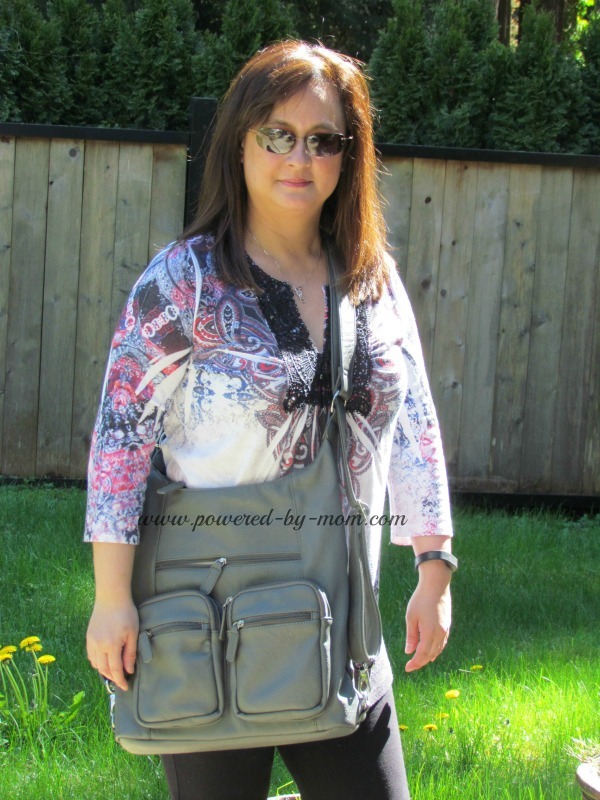 I love these bags that are multipurpose! These bags look very nice. Thanks for sharing! this is very functional anc carries a lot..use it as a purse ! I LOVE THE SIZE!!! the fact it can double as a purse and a camera bag never mind there is enough room for it to be a diaper bag as well! Awesome! I love that it is so roomy! I like that this bag could be a cross body or a backpack.I also love that it is so roomy,and that it zips to close. I love how much room it has! Although I have no money right now, I’d love to have this for my gear! I don’t have a lot of attachments yet (hence why I have no camera bag), but I know I’ll need a bag like this in the future! I love that they have so many sizes and styles…. Three Velcro panels can be adjusted to any position for maximum customization is an awesome feature. I also love that it can be used as a purse and a pretty one at that! I like all the compartments that it has. Can be used for anything. I would love, love ,love to have the turquoise colored Sidney’s hand bag. my girlfriend would love to carry it. So here is to hoping I get picked for this one. I learned that the Madison bag is three bags in one! I love that the bags are versatile and comfortable and looks very fashionable. I love that it has lots of extra pockets and great lining for protection. The fashionable styles don’t hurt either. Its all one could ask for in an AMAZING camera bag. Thanks so much for the review! Epiphanie bags are so stylish yet functional for a camera bag! I love how versatile these bags are! Over the shoulder, cross-body, back-pack – you can wear them so many ways! Wow! I love that you can fit so much inside.. use it 3 different ways.. without changing the straps! That is pretty impressive. Now I’m adding the Madison to the list of epiphanie bags I’m coveting. I like how the bag is water resistant and so super cute! I learned that the Madison bag can be worn 3 different ways,over the shoulder,cross-body and as a backpack.This bag is awesome! I have been looking at their bags for a little while just dreaming about ownership rights to one of them! I learned that the Madison bag is convertible and can be worn three different ways – over the shoulder, cross-body, & backpack. Super handy! What a great looking bag! I would totally use these bags as a purse they are so nice. I love how many packets they have. That is a very nice bag.I love that it can be converted to a back pack! I learned that the dividers are removable and that the madison bag is like 3 in 1 bag – I love it! Thanks for the review. I have been trying to decide which of their bags I want. I like the pockets and room in the Sydney. Though seeing it makes me think I want a somewhat smaller one. I love all of them. Thanks again. I dont have a camera but I would make good use of this bag! I love all the compartments. I really like this bag. It really looks nice as a backpack. This would be a perfect bag for my daughter who always has so much stuff to lug around. I love that these bags are so stylish and you can use them as a purse as well. I really love these bags! The styles & colors are all very nice! Love the look of those bags! They are on my wish list for sure! There are a lot to pick from. Many colors. I like that you posted pictures – I was wondering how that would turn into a backpack! I remember all the really ugly bags that were all you could find many years ago. This is nice. I love that you can change out the pads however you want or eliminate them altogether. Genius! 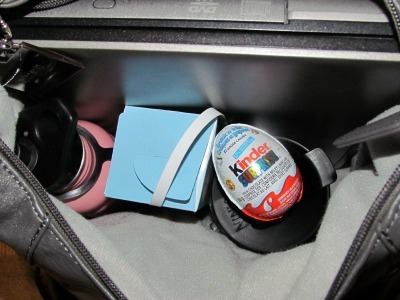 I love that it can be used as a purse, too, by removing dividers! I’m so glad you reviewed the Sydney bag. I like that it holds so much and it’s not bulky. I love all the zippered compartments! That is so handy! I like that they look like a regular purse but still had the ability to protect an expensive camera, while accommodating all of the other things we need to carry from place to place. I love that you’ve shown exactly how many things you can carry in the bag. One bag for everything! camera equipment in the bag. I love that you can use these bags as purses too I hate carrying two separate bags! I don’t like carrying a purse so I am so glad these will hold my small amount of extras in addition to my camera. A fashionable camera bag…who would of thought!?! I like your review, it’s been the most helpful that I’ve seen so far, because this is the bag I like the best and I’ve wondered what it would be like in real life. Your photos are practical and applicable, I’m able to see the proportions better and with the items inside the bag, I’m able to sort of “picture” my items in the bag. I love the size, versatility and construction of these bags. Even though it is designed for carrying a camera, it’s so nice that they can be used as an every day bag. I love that I only have to carry one bag, and it has room for everything I need! these would make great diaper bags too! I find it fascinating that is converts to a backpack, and others do as well. These bags are all so gorgeous and well made getting any of them would be a bonus. My om would love one of the Ephipanie camera bags! They are so well made and very stylish! These camera bags are awesome. I love the photos that you included. It makes it easy to see how much it can crry and what it looks like to wear. Thanks! I love these bags.They have so many beautiful colors to choose from and they look like they are very well made. My favorite is the Charlotte bag in Tourquise! So cute! I like how you included pictures of you using the bag and with your items. I’ve seen some reviews with just stock pictures of the bag and not gotten much out of the review without the real-life visual. I love the bag you chose. Great review, you answered a few questions I had. The photos really help see the dimensions, and I love it as backpack style…..that would be really helpful when carrying a heavier load. 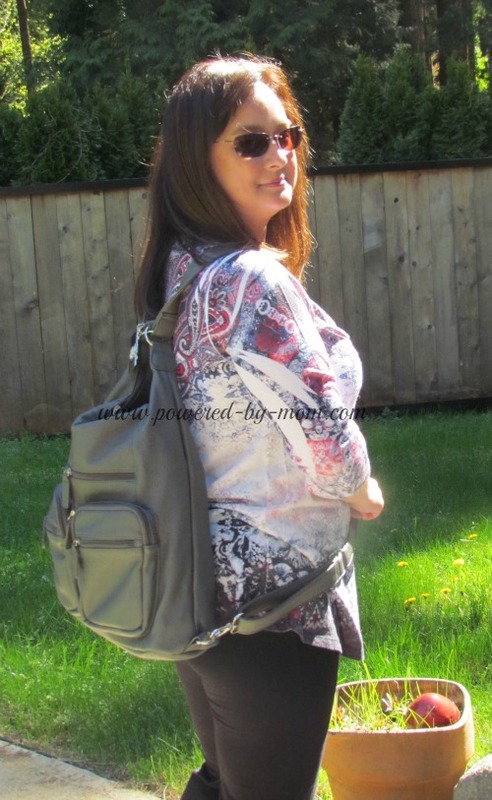 I love that these bags are so versatile, that you can wear some of them as a backpack or crossbody style bag, as well as being able to use it as a purse or diaper bag! Love these bags very convenient. I learned that there’s a pocket for every item conceivable, and I can wear these bags crossbody! I love it! I love the backpack style of the Sydney but I would need something slightly bigger but good to read about the features and quality of epiphanie. Thanks for the review. Thank you so much for reviewing the Sydney. I’ve been looking at this bag and this review is just what I needed. I do wish I could get my 17″ laptop in there too…for when I need it. you can use this for more than a camera lots of pockets and room ! Wow. Im impressed with the bag. Its so spacious you can use it for almost anything! Love them bags and the review! So big you can use for a camera bag and diaper bag both. I love Charlotte camera bag so pretty!!! Gray matches everything! So versatile! 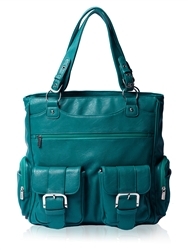 I love the teal color of that Madison bag above!!! These bags are large enough to care everything. These camera bags are really big and roomy. I like so many of the stylish and gorgeous colors that are available. Your camera bag really looks nice on you, and I would love to own one. I love that this can be worn cross-body or as a backpack! Love the handsfree aspect! I like the ability to change the straps on this bag. Very convenient. I’ve been wanting an Epiphanie bag for over a year now! I keep trying to win one. I adore the Red Lola bag. I love that the Madison bag can be used three ways and can easily be used as a purse as well. It’s large as well so it sounds like my kind of bag. I like that it can be used as a handbag too, very nice! How cute! looks like you still have plenty of room for more gear! I like that you can wear it different ways! I love these bags. They are very stylish and you would never know it was a camera bag. I think you are wise to use it as a regular bag too. They have some great styles. Thanks for the great review. I love how the bag has all the different pockets and it’s awesome to see a pretty camera bag that looks like a purse. I LOVE THAT YOU CAN USE IT AS A PURSE TO.